I can't help but think about you. Or what you're up to now. Or if you will ever come find me here again. It makes me so lonely, all this thinking about you. And thinking about why all I have for company now is coffee. You could have been here. You should have been here. I've been here almost every day for the past month, and it makes me lonely, knowing I will probably never stop waiting. So I guess for now I'll just drink my coffee. Slowly, but not too slow to let it go cold. 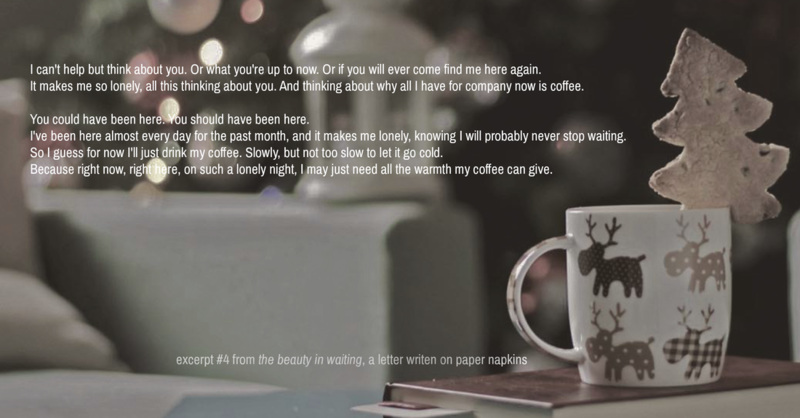 Because right now, right here, on such a lonely night, I may just need all the warmth my coffee can give. For so many people this night might be special. It's actually quite strange if you think about it. It's unusally cold, even when it's really supposed to be on a Christmas eve, but something about a night like this keeps people warm inside. But not for me. I'm cold and I'm longing for you. I am feeling a subtle pain in my chest, the kind that being unable to say what you want brings, and I am wondering when I'll see you again. I know I'm a romantic, and I'm really, really hoping you are, too. Because, hey, you have to admit, what can be more romantic than you walking up to me on a Christmas eve, and hopefully while smiling, telling me you miss me? Just like how I'm terribly missing you tonight. Cliche, maybe, but who doesn't want to be in on a movie scene like that? I'm a girl, of course I like chick flicks. I remember watching movies and feeling a deep kind of pain when the last scene fades to black, and the next scene comes onto the screen bearing a seemingly easy phrase in the likes of "two years later." You see, it's easy to watch a scene play out as the guy in the story kept onto some form of routine, going to the same bar, eating the same food, drinking the same coffee, working the same eight hours, and feeling the same longing. But when you truly realize the pain of not knowing if he will ever show up again, and yet you wait—just as the actor waits—and you do the same thing over and over again in the hopes of finally meeting him again, you will finally see the beauty in waiting. I wait. It's painful. But there lies the beauty of it. I'm soon onto my third cup. I've been here for hours, and frankly I didn't seem to really feel time pass by. I don't think I'll ever get tired of waiting for you. But if ever I do, and I stop coming to this place, I hope you don't suddenly show up. I mean, we aren't movie characters, are we?